I grew up in the South. And in the South we tell stories. Every day at 5pm, my great-grandmother would hold court during Happy Hour, where she would drink bourbon and tell stories. My grandmother and her sisters would join in as they transformed fiction into fact. It was at their feet that I learned how to tell a story. But it was in a dark, dilapidated theatre on 52nd Street that I became a writer. Youngblood is the Ensemble Studio Theatre’s lab for playwrights under 30. Well known for their annual marathon of one act plays, EST has been an incubator for new work since its founding. We met once a week where we would do writing exercises, then members would share new work. It became a safe space where I could count on receiving constructive feedback. With different backgrounds, we were all telling different stories. It was an invaluable resource for a young writer trying to learn the craft. Youngblood not only taught me how to be a writer, it taught me how to be a theatre artist. Theatre is a collaborative art and in order for our work to succeed we all had to pitch in. Recognizing that plays are meant to be seen, not just read, we were always creating opportunities to put our work on stage. There was Asking For Trouble, a series of short plays written and rehearsed in a week. Every other year we produced Thicker Than Water, an evening of fully produced one-acts. In between there were readings and workshops, which created deadlines to hold us accountable for our writing. And to make those events a success we all had to support one another. We read stage directions at readings. We ushered for shows. We put up posters in coffee shops and asked family members to donate money. We swept floors, took tickets, and ran lights. My day job at an investment bank regularly supplied us with copies of scripts. We were a motley crew of young writers, all working multiple jobs while trying to make theatre and hone our craft. In the summer months we would pack up and go to the EST retreat in Lexington, NY where we slept in bunkhouses, cooked our own meals, and told stories by the late night fire. The group has grown and competition for membership has become fierce. Amy, Jason, and Edith were already members when I arrived a Youngblood. More than 15 years have passed and we are all still be writing, as challenging as that is at times. We have all been fortunate enough to receive validation by the theatre and film community. Amy’s play, Heights, was first presented as a one act during our Thicker Than Water production. Merchant Ivory optioned the play, which was then adapted into a feature film starring Glenn Close. As members of Youngblood, we were able to experience the process vicariously through her. Now a professor at NYU, her most recent film, Equity, debuted in the summer of 2016 to critical praise. Jason, a lifelong New Yorker, moved to LA a few years ago. He made the decision to give up playwriting and instead has been focused on writing for film and television. The winner of the prestigious Humanitas fellowship, he was recently a writer on the Fox show, Pitch. 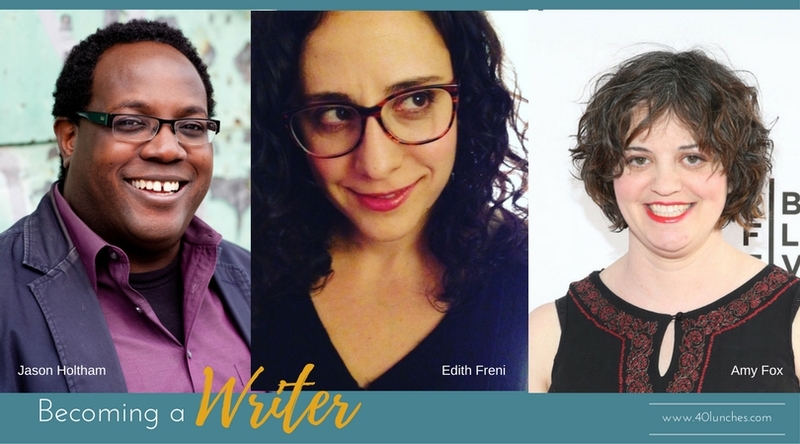 Edith has enjoyed a commission from Steppenwolf and was the inaugural playwriting fellow at Emory where she taught for two years. And after all these years, Edith and I have found ourselves living on top of the same mountain in Tennessee. Sewanee, which originally brought me to Youngblood (thanks to my mentor at the SewaneeWriters’ Conference), has brought Youngblood to me. It would have been great to find a nice little café and overstay our welcome while catching up, but with four writers in three different time zones, the logistics were impossible. Instead we opted for a virtual visit, which was almost as good. As we talked about our time in Youngblood the thing we kept going back to was that the communal, collaborative nature of the group taught us all about generosity. We learned how to champion the successes of our fellow writers. That generosity has served us well as we navigate the professional world where not everyone is as supportive. But we all still struggle with some of the same fundamental challenges that we faced when we were younger: What will the next gig be? As an artist it is easy to feel like your last job will be your last job. It’s a career that in many ways is defined by uncertainty. Amy continues to call New York her home, but the rest of us have moved quite a bit, all in search of work. Life in the theatre can feel very migratory at times. We talked about our desire to feel settled, to have a sense of permanence. But even though there are moments of doubt and the occasional threat to leave the business all together, we all love what we do most of the time. Our visit serves as a reminder that it's important to have a community of people who are a part of your history and share a common vocabulary. New to 40 Lunches? Read more about the project here and check out some of my previous lunch guests here. You can also follow along on Facebook. Really liked hearing this piece of your writing history. Thanks, Nina. Every young writer should be fortunate enough to have that kind of community.